Changing fund administrator is a significant decision. A detailed plan with a dedicated handover team ensures that the transition of a fund to Centaur is made effectively and seamlessly. Centaur provides a project management service for each stage of the transition of a fund, from signature to operation. 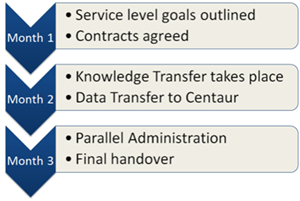 Service level objectives and goals are set for each phase of the transition and Centaur distributes a launch pack to the client supplying key information about the process. An effective transfer timetable is agreed to minimize service disruption. Notice is given to the current administrator to coincide with the service startup date. Launch pack sent to client including questionnaires, list of required documentation and contact lists. Clear and timely communication addresses any issues that may arise. The administration agreement is prepared and agreed. Regulatory reporting requirements for the Fund are identified and agreed. Works with the outgoing administrator to understand the fund’s systems and processes. Identifies areas where efficiency can be made, ultimately leading to more timely reporting once the fund goes live. An integrated technology solution creates a more efficient process, leading to lower costs and increased accuracy of reporting for the fund. Both financial and non-financial data in any format is collated, analysed and integrated into Centaur’s workflows and technology platform. Once files are received from the outgoing administrator, a gap analysis of the data is carried out versus AML (Anti-money Laundering) legal requirements to ensure all conditions are met. Financial statements and information relating to the latest NAV of the Fund are reviewed. A fund’s parallel period is initiated by Centaur following a full assessment of the fund’s operational and service needs. Regular updates are provided reviewing the transition status and identifying and resolving any issues that may impact on the success of the project. Risk Management including risk identification, risk analysis and resolution. Relationships are developed and maintained with the client’s external service providers, such as auditors and brokers. The switchover of administration services only takes place when a steady state is reached and all targets have been met. Systems and processes are tested and reconciled with the previous administrator, full NAVs (Net Asset Values) are prepared and all stakeholders are informed. Centaur speaks to investors and handles all due diligence in a professional manner including completion of due diligence questionnaires, hosting of due diligence review meetings, and attend meetings in the investor’s offices.